A distributed denial-of-service (DDoS) attack also referred to as a Distributed Network Attack is a malicious attack aimed at disrupting normal traffic of a targeted server, service or network by puzzling the target or its surrounding infrastructure with overwhelming Internet traffic. To accomplish this, DDoS makes use of multiple compromised computer systems and other networked resources such as IoT devices as the sources of attack traffic. Simply put, a DDoS attack is an online traffic jam, preventing the site from functioning correctly. How does a Distributed Denial of Service attack work? In Distributed Denial of Service attack, the attacker attempts to overwhelm a website or network with internet traffic. Therefore, online criminals take control of computers and IoT devices to carry out an attack. The computer systems and IoT devices are infected with malware to convert them as Bots. The group of bots is called a botnet, and the attacker controls them through a remote-control mechanism. The attack appears legitimate as each bot is an authorized Internet device, thereby, segregating the offensive traffic from normal traffic is impossible. Each bot sends out requests to the target, thus bringing the targeted server or network to a grinding halt, this results in a denial-of-service even to the average traffic. DDoS attack vectors can aim at different components of a network connection, and this aspect changes the impact and result of an attack. DoS attacks usually arrive one of two forms. In the process, the offense either overwhelms web services or crash them. An overwhelming attack is the most popular form of DDoS attack. It happens when large amounts of traffic flood the targeted system that the server is unable to handle. The website or network ultimately stops. Also known as a ping flood, the ICMP Flood attack sends spoofed packets of information that hit every computer in a targeted network. In the process, it takes advantage of misconfigured network devices. A UDP flood type of attack targets random ports on a computer system or network with UDP (User Datagram Protocol) packets. It involves sending high volumes of UDP packets to the target machine. This attack exploits the vulnerability in a TCP connection sequence. Often known as the three-way handshake connection with the host and the server this is how it attacks: the targeted server gets a request to start the handshake. However, in an SYN flood, the handshake is never achieved. That keeps the associated port as busy and unavailable to process further requests. In the meantime, the attackers proceed to send more and more applications, flooding all open ports to shut down the server. Ping of Death is a type of DDoS attack which manipulates IP protocols by forwarding malicious pings to the targeted computer system. Of course, this attack scheme vouches on the acknowledgment of target machines. It can essentially raise bandwidth usage, ultimately making the server to slow down or crash. Smurf Attack is a type of DDoS attack which uses a specialized class of malware known as ‘smurf’ to exploit Internet Protocol (IP) and Internet Control Message Protocol (ICMP). In this type of attacks, the targeted machines are flooded with spoofed ping messages-rendering the targeted machine unresponsive. Application Level Attacks exploit security vulnerabilities in the applications (targeted system’s applications). The ultimate aim of this type of DDoS attack is not to target the entire server, but applications with known vulnerabilities. Advanced Persistent DoS (APDoS) is a type of DDoS attack which is aimed at inflicting severe damage to the targeted computers/networks/servers. In the process, it implements a variety of attacks such as the HTTP flooding, SYN flooding, etc., to attack the targeted devices. Generally, DDoS attacks may last for numerous days to weeks, primarily due to the capability of the attacker to switch tactics at any moment and to create modifications to evade security defenses. A zero-day DDoS attack is yet another type of DDoS attack which is comparable to zero-day cyber-attacks. The attack exploits zero-day vulnerabilities for which no patch is available in the targeted systems. Crash attacks rarely happen. The attacker transmits bugs that utilize defects in the system. As a result, the system crashes. How to help prevent DDoS attacks? The primary reason for launching these attacks is to stop legitimate users from accessing online services. It could be anything such as websites, gaming sites, email, and bank accounts. Online criminals use advanced attack tools which are downloadable programs, even those who don’t have the essential know-how can buy the potential to launch and control their DDoS attacks. The DDoS attacks are anticipated to become more and more sophisticated as attackers are now starting to induct everything, from routers to gaming consoles and modems, to raise the volume of attack traffic that they can generate. Therefore, safeguarding internet-connected devices and services is more about helping to defend the internet as an individual network as it is about decreasing the number of devices that can be recruited to take part in a DDoS attack. It is necessary for anyone to have a software tool that will protect from DDoS attacks. The DDoS attacks are usually undetectable through manual checking. If the antivirus tool has a feature called the DDoS mitigation, it will help the user by sending out an alert to ward off unwanted DDoS attacks. There are a few ways by which a DDoS attack can be dealt with quickly. The first and foremost thing to do, it is to have an antivirus software solution in place and distributed hardware equipment. The system administrator should periodically monitor the website/computer/server/network performance metrics and secure the capability. A DDoS attack is carried out with an extreme packet-per-second rate, a mitigation solution with decent packet processing power can take control of the situation. The administrator is responsible for you to considering and measuring the analytics in an infrastructure. When a user requests for a realistic performance from the vendor, it might surprise the user as the numbers could be meagre. In the present time, DDoS Attacks are launched simultaneously. Datasheet performance figures give a good indicator to match the product to your requirements. However, it is indeed advisable to test your prospect mitigation solution. For any website, bandwidth is an essential metric, and users require bandwidth that can manage as many users as possible but, they may not be aware of a few things. Therefore, the networking devices which generally differ in size get processed by network packets. Small packets use less bandwidth, and larger bandwidths are used by large packets. An attacker can quickly stress out the infrastructure by sending several small packets at a high rate – particularly traditional security infrastructures such as Intrusion Detection Systems, or firewalls. Comodo Free Antivirus can investigate all the tiresome and complicated measures involved in DDoS prevention. The award-winning free antivirus provides unmatchable protection from every type of malware. The super-fast cloud scanner prevents malware even if the user does not has the latest updates. It prevents ransomware and zero-day threats by securing them in a guarded container where they cannot infect the computer/network. 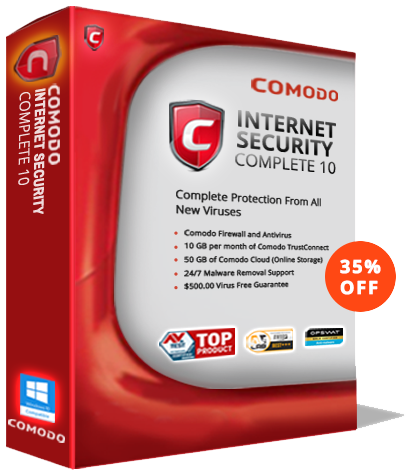 Comodo’s free virus removal software provides the best protection from malware instances, virus infection and suspicious hidden files. It is reliable, cloud-based protection that scans, and updates continue to include the latest malware information from around the globe. For more information or to download the antivirus software visit the official Comodo Free Antivirus page – Try it today to stay protected! What is a Worm Virus? How to Prevent Mirai Botnet DDoS Attacks?